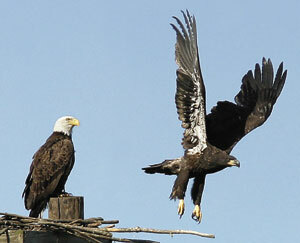 In the spring of 2006, once again bald eagles nested along the Delaware River less than a mile below Portland PA. But a year has made a big difference in what this offered to eagle watchers. In spring of 2005, a pair of bald eagles took over a former osprey nest that had been built atop a wooden nesting platform, successfully hatching and raising a pair of eaglets. This first nest location offered to observers on the nearby road a nearly unobstructed view of the nest and the activities of its inhabitants. During that 2005 nesting season, one of the parent eagles frequently perched on a tall evergreen tree just a few hundred feet distant from the nesting platform, keeping guard from there over the young eagles. The eagle pair must have liked that evergreen because by February 2007 they had constructed a new nest in its limbs. But unlike the unrestricted viewing of the nesting platform, this new nest was partially obstructed by some limbs of the evergreen and there was much more shrub and tree growth between the observers on the road and the nest in the evergreen tree. For a while between nesting seasons the eagles could be seen on either of the two nests, sometimes perching on the platform, other times perching in or around the new nest in the evergreen. But by March 2007 at least one of the parent eagles seemed to spend most of its time sitting within the new nest, giving the impression that it might be incubating a new brood there. During this apparent incubation period, the parents would often switch nest-sitting duties. During the second week of April, hopes that a new brood of eaglets existed were fulfilled when it became obvious that the adults, now parents again, were feeding something in the bottom of the nest. By looking patiently with a spotting scope, movement could sometimes be seen through the small open spaces between the lower sticks of the nest. Every so often, as a parent offered small morsels of food downward into the nest, some small movement could be seen moving upward toward the parent’s beak to receive the food. At times it appeared that the parent was poking the food toward two separate areas of the nest, indicating there could be more than one eaglet in there. By the end of April’s second week it was not unusual to see a small eaglet sticking its head up in plain view, taking a quick peek around before quickly ducking back down into the nest. And every once in a while TWO little heads could be seen peering attentively out of the nest. Even at this young age of only a week or so, when a parent would fly from the nest, loud screeches of protest could clearly be heard from the little eaglets, not wanting to be left alone even for short periods of time. The loud volume of these screeches was surprising considering the small bodies that generated them. At other times their loud shrieks could be heard in anticipation of a fresh meal as they spied a parent eagle approaching the nest with food in its talons. Due to their rapid growth rate, greater amounts of food were brought to the chicks during their first month or so than when they were approaching adult size later around the beginning of June. In April and early May, during the eaglets’ first few weeks, there were frequent sorties leaving from and returning to the nest as the parents brought back food, sometimes taking turns between hunting and tending the nest. However, by the eaglets’ fifth or sixth weeks around the end of May, the feedings seemed to diminish noticeably. The newly-hatched eaglets, at first covered with down, grew fast. For the first few weeks, from April to mid-May, it appeared as if they doubled their size every week. By early May, during their fourth week, the chicks were beginning to develop some noticeably black feathers and were two or three times their size of the first week. By mid-May they were covered with more black feathers than with the grayish down. As more and more feathers appeared, the eaglets spent a lot of time preening themselves, pulling out loose down and letting it fly in the wind. Most of the time small bits of plucked down were stuck to their beaks. Watching the interaction of the parents during the nest fly-ins was interesting, even humorous at times. Usually the smaller of the two parents, presumably the male, would be the one returning to the nest with food or more building materials. Most of the time the larger parent, presumably the female, would be in the nest attending to the nest duties. As the season progressed it seemed as if the female was perturbed with the male. She would puff herself up and put on a fearsome face as he approached the nest and while he spent time in the nest. This seemed to be a new action this season, not being noticed much if at all last year. Some of the female’s posturing during these episodes was humorous to watch as her face seemed to take on the qualities of her perturbed human counterpart and the male seemed to bow submissively with a frustrated look on his face. Whether these emotions were really as they appeared is a matter of conjecture. A few times after bringing food back to the nest, the smaller eagle, the male, sat patiently beside the female trying to tease her into giving him a piece of food by almost playfully rubbing her beak with his. This seemed to only perturb her more. Why he did this is a question since he could easily have helped himself to food before bringing it back to the nest. The time spent by the parents together in the nest was minimal. Throughout the 2006 season, it was uncommon to see both parents in the nest at the same time for more than a few minutes. The larger parent, the female, spent the most time at the nest with the chicks. Once in a while, as one parent flew in with food the second parent would watch it feed the young ones for a minute or so and then it would take off, leaving the other parent with the chicks for a while. Usually though the smaller parent, the male, brought the food, stayed in the nest a few minutes and then would take off again, not returning for quite a while. 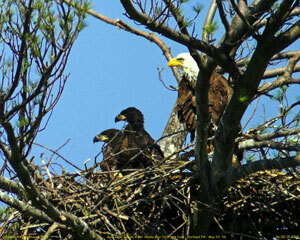 Even though the new nest was being actively used to rear the eaglets, some nest construction or improvement continued. Very often one of the parents would return to the nest, not with food but with sticks of varying sizes or with clumps of grass, especially during April and May. Usually the parent could be seen immediately positioning the materials within the new nest. Every so often a parent would bring back a fresh sprig with green leaves still on it. One branch was positioned in the edge of the nest and the parent then leisurely picked off each leaf one by one, first chewing it and then apparently pushing it into the nest floor below. Some naturalists believe this helps to freshen the nest. The eaglets’ diet was a diverse one, ranging from frequent fresh-caught sunfish, trout, suckers, and bass, to occasional snakes and eels. At times the parents returned with road kill such as squirrels and groundhogs. More than one person noted seeing one of the parents swoop down to take live squirrels from the branches of nearby trees. Another person saw a groundhog in a nearby field suffer the same fate. And yet another person saw a parent eagle fly back to the nest with a duck in its talons. During April and early May, upon returning to the nest with prey, the parents would usually tear up the prey immediately and feed it to the chicks. But by the eaglets eighth week later in May, the eaglets were able to tear up the prey and feed themselves. Nevertheless they still successfully begged to be fed morsels torn up and offered by the parents in response to their begging. A few times, before offering mammal prey such as squirrel or groundhog to the eaglets, the parent would quickly tear off the fur, sometimes so rapidly tossing the fur into the air that it fell like snow. Many of the fish brought back appeared to have been gutted or partially devoured, especially when the eaglets were in their later weeks, probably due to the parent first feeding itself before finally offering fresh meat to the chicks. For the first month or so, the eaglets seemed to share their turns while feeding, one eaglet waiting unselfishly before taking its own turn to eat a few seconds later. There did not appear to be an alpha eaglet. Later though, by their seventh or eighth week, as the eaglets approached adult size toward the end of May, very often one of the eaglets would take a very long turn of 10 or 15 minutes while the second eaglet waited only somewhat patiently nearby. Frequently this patience wore thin and the second eaglet would jump toward the food, trying for its share too. More than once they would face off at these moments. Sometimes the first feeder would give in, sometimes it would not. Between feedings it seemed as if the chicks spent a lot of time resting although every so often they could be seen playing, running around in circles in the nest while the parent’s head moved in comical circles as it followed their motion. As the weeks went by, their playing showed more signs of nest boredom. Sometimes they could be seen tossing sticks or clumps of grass almost impatiently, as if waiting for something to happen. Other times they could be seen watching the ever-present carpenter bees flitting about, often trying to quickly pluck one from the air with their large beaks. Sometimes the eaglets would walk over to the parent, probably the mother, look at her as if begging her attention, and then would flop down at her feet, clearly underfoot. Not many weeks went by before this seemed to irritate her and she would hop up to a higher branch to get away from them but still be close enough to guard them. As the eaglets got older, that parent spent more and more time up on those higher out-of-reach branches, frequently preening, or even yawning and dozing. 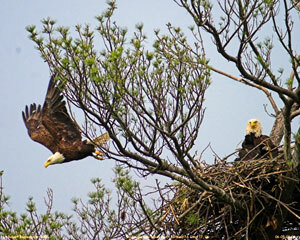 It would be weeks before the eaglets’ wings would be able to let them follow her up there. As they got older the parents seemed to spend more and more time guarding the eaglets from a distance by sitting on the previous year’s distant nest platform. The two nest sites had now switched roles from the previous rearing season. As the eaglets became larger and more active they spent more time near the upper edges of the nest where they would look out attentively over their environment as if wishing they could fly. But despite the increased activity as they got older, even during their last weeks in the nest, they had long periods of inactivity and rest each day, often for hours at a time. Later in May, around their fifth week, the eaglets’ wing-flapping was becoming more obvious and more frequent. They were beginning to strengthen their wings for their first flights that would probably happen around the end of June. By their eighth or ninth week later in May, the eaglets seemed to enjoy spreading their wings in a breeze, jumping up high and then letting the wind slowly set them back down, almost as if they were gliding in position. Near the beginning of June, they were able to jump from the nest up to the higher branches on which the female for weeks had sought escape from their attentions. Depending on the wind speed, their “glides” over the nest were now becoming higher and they could hover much longer, almost as if they were ready to fly from the nest. By mid-June, their eleventh week, they spent a lot of time on the upper branches above the nest looking out in the distance as if pondering if it was yet the right time to attempt flight. They were nearly able to fly then, frequently spreading their wings into the wind, hovering, almost letting themselves glide from the nest. Sometimes when looking at their size and gliding ability it was hard to believe they had not yet flown. In fact, some infrequent observers assumed their first flights had occurred by then but it was not until around the end of June, their twelfth week, during which they took their first flights. During that twelfth week, the last week in June, the Delaware River flooded over most of the roads near Portland. It was around this time that some observers saw some of the eaglets’ first flights. In very early July at least one person saw both eaglets out of the nest. One of them was circling around near the nest but unfortunately the other eaglet was on the ground below the nest. It appeared to be attempting to fly but could not seem to be able to get off the ground. Some time shortly thereafter a nearby worker reportedly spotted a dead immature eagle on the ground not far from the nest. It was most likely one of these two eaglets. If the data is correct, nearly 40% of young eaglets do not survive their first flights. Hopefully the second eaglet successfully learned to maneuver through its surrounding skies. If you spot eagles nesting, make sure you do not disturb them in any way. Try to observe them from inside your vehicle, using it as a blind. If you do step outside, try to stay very close to the vehicle, hiding yourself as much as possible. Absolutely avoid any loud sounds such as honking the horn, slamming your vehicle's doors, calling out, or loud music. Keep your pets at home, away from the area. Eagle nesting areas are protected by both federal and state law. Violation of these laws could prove costly and might also include incarceration. Do not approach the nest area; instead use binoculars or a spotting scope to view the birds up close. Do not try to make the eagles fly. Honor the signs that restrict the eagle nesting area. 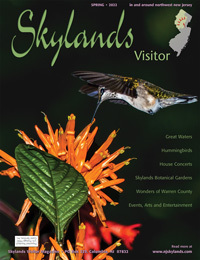 All photos included in this article were taken by Bob Koppenhaver at the Portland bald eagles' nest during the spring and summer of 2005 and 2006. If you are interested in obtaining photos of local eagles, you email Bob for more details.